What If Pope Francis’ Enemies Are the Same as Pope Benedict’s? Pope Francis: Will It Really Be a Revolution? Everything for the sake of synodality. This seems to be Pope Francis’ governing program. The Pope has already made it clear that he deems the conversion of hearts to be more important than the conversion of structures. He carefully considers every step to further expand the footprint of synodality, a wider sense of discussion within the Church. His basic idea is that of a dialogical Church going out of itself, a Church that is open and present among people. Coupled with his conviction that the poor evangelize is Pope Francis’ understanding of the Church of the peripheries as the way to evangelize and purify Rome, which he considers too self-referential. His latest move in this direction is a modification of the practice of bestowing the pallium. Each year on June 29, the Feast of Saints Peter and Paul, metropolitan archbishops appointed to their sees within the past year are summoned to Rome so that during the Mass the pope can invest them with the pallium. The celebration is a sign of the unity of all the local churches with the See of Rome. Pope Francis has decided to modify the practice. Metropolitan archbishops are invited to Rome to concelebrate the feast day Mass with him, and on that occasion he will hand each one of them the pallium privately. But it will be officially bestowed upon each of them only at a later date by the apostolic nuncio of their country in a public celebration with the participation of all the suffragan bishops whose dioceses comprise their ecclesiastical province. This is one more way that Pope Francis hopes to promote synodality. To make this change, Pope Francis returned to the practice described in the Cerimoniale Episcoporum (Chapter V, nn. 1149-1155), which states that the metropolitan archbishop is to be invested with the pallium by the ordaining bishop in the name of the Pope. The long-planned curial reform also aims to emphasize this local church dimension, although it has not yet taken a definite shape. The decision to change the practice of bestowing the pallium was made public almost on the eve of the ten days of a sort of permanent synod that Pope Francis has called, before the Curia departs for its annual Lenten retreat to be held at Ariccia, close to Rome. Thus, from February 6-15 cardinals and bishops, commissions and councils will gather at the Vatican, mostly to discuss curial reform. The Council for the Economy will hold its meeting on February 6. On that same day, the Pontifical Commission for the Protection of Minors will begin its two-day gathering: it is the first time the Commission will meet with all of its members present, and it will discuss and finally approve its statutes. From February 9-11 the Council of Cardinals will meet and discuss curial reform; the outcome of this discussion will be reported to the ordinary consistory that will take place on February 12-13. 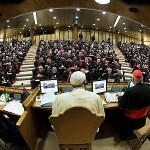 On February 14 and 15 the extraordinary consistory for the creation of new cardinals will be held. This series of meetings is crucial for Pope Francis. This is the moment when his pontificate will take shape. Now at the conclusion of the second year of his pontificate it still remains to be seen whether the reforms he hopes to introduce will just lead to a sort of permanent synod, or whether there will be even more structural changes in the central government of the Church. Pastoral issues will be addressed by the upcoming synod of bishops. Following that event it will be possible to draw a conclusion. Will Pope Francis’ pontificate be merely transitional or will it give the Church a new shape? Only history will tell. Certainly, the game on two fronts (curial reform and the synod) is already underway. In regard to curial reform, the heads of Vatican dicasteries did not like the initial plan. When Bishop Marcello Semeraro, secretary of the Council of Cardinals, presented the draft during the regular meeting with the heads of dicasteries on November 24, they strongly criticized it. The proposed creation of two mega-congregations, respectively, for Justice and Peace and Family and Laity (each of them with five secretariats, encompassing several currently existing pontifical councils) received more criticism than expected. How were the various competences to be organized? Which secretariats would be entrusted with the functions that, while not provided for in Pastor Bonus, were nevertheless assumed by the various pontifical councils that had been created over many years? How should issues that currently fall within the competence of two or more dicasteries be handled? The draft did not answer these questions. Some changes and adjustments were subsequently discussed, but these questions still remain. Nevertheless, some Vatican dicasteries have already ventured a response. When the Council of Cardinals distributed a questionnaire asking the curial dicasteries which competences could be entrusted to the various local dioceses, they simply responded that there were none. One reason they gave is that issues are normally handled at the local level and then referred to Rome, where more general policies are formulated. The risk of terminating this reciprocal communication loop is that the local dioceses will lose their connection with the Apostolic See, No Vatican dicastery wants to run this risk. From the curial perspective the question is not about clinging to the idea of centralized power in the Church, but about maintaining a common vision. There is one Church, not many. This is one of the most debated issues when speaking about synodality. These words represent a clear governing program, and at the same time reveal Maradiaga’s need to be in the spotlight and to take a strong stand, for it is not certain that the final outcome will favor the peripheries. Many bishops on the peripheries have been stressing the need for a central, coordinating institution to which they can refer questions and problems. They understand the risk of making general issues out of what are really local issues. They insist that a balance between the local and universal levels of the Church is always needed. Pope Francis hopes to reach this balance by bringing about even more synodality. His final goal seems to be that the Church be brought as close to people as possible and that it show them the power of dialogue. The people and the Church must stand side by side in his view. This goal explains his decision to change the practice of bestowing the pallium so that the ceremony takes place within the context of a local Mass. This goal also explains the decision to focus the spotlight on a Church that debates questions in a lively manner, as would be the case with the establishment of a permanent synod. However, this state of permanent synod also carries with it the risk of showcasing the opposite result – a lack of communion. While the 2015 synod is already being prepared, discussions over the conclusion of the 2014 synod have not yet ended. The controversial synod’s final report, which failed to reach a consensus on many points, proves that there is indeed a lively debate. Moreover, this debate does not always favor a pastoral plan that promotes mercy apart from doctrine. Does the ‘pastoral’ not involve the application – even in creative terms – of doctrine? Not according to the General Secretariat of the Synod. Along with the Lineamenta that were mailed to the bishops’ conferences, the Secretariat sent questionnaires and insisted that the replies were not to focus on the application of doctrine. Neither does Cardinal Lorenzo Baldisseri, General Secretary of the Synod, understand the pastoral in terms of the application of doctrine. Recently, he defended the most controversial parts of the synod’s final report: “All of those points have been personally approved by Pope Francis,” he declared, thereby shielding himself with the papal fiat. But Pope Francis does not seem to have in mind a precise doctrinal or reform project. He simply seeks to make the Church less “self-referential,” and for this purpose he does not hesitate to push the discussion within the Church into controversial matters, even by means of his choices of new cardinals in the coming consistory. His governing decisions often tilt toward the progressive side. But his formal declarations have often been not only orthodox, but very conservative. This is the reason it can be said that the moment of truth has come. If no concrete vision of the future of the Church emerges from this state of permanent synod, this papacy will leave posterity only an enormous missionary effort. But will this be enough? You wrote, “He simply seeks to make the Church less “self-referential,” and for this purpose he does not hesitate to push the discussion within the Church into controversial matters, even by means of his choices of new cardinals in the coming consistory.” The question is: Are there certain aspects of “self-referential” that should not be thrown out and dispensed with? Agreed, we can not expect to convert many people by simply saying, “believe this because the Catholic Church says this”. On the other hand, once people come to the Catholic faith, then they can be helped to advance in knowledge of what God wants all to believe by showing them the explicit evidence of Church teachings (Catechism of the Catholic Church) and then they can continue with the work of trying to understand as much as they can the way God wants all to understand it. For much of the world, we have to rely on God’s grace and the correct forms of apologetics, shared with love, over a long period to help others come to the one essential point : For them to believe that God wants them to seek to know everything that He wants everyone to know and believe, and then for them to will to accept this lifelong vocation of seeking to know the truth, Jesus Christ. Hopefully, the devil will not be allowed by God to convince people to throw out the good with the bad. Is this trying to pass as good analysis? It is so thinly constructed and the assumptions are stretches at best. I think this author should leave this kind of stuff to others. I really dislike the thinly disguised snide attempts this author keeps doing in all of his articles to discredit Pope Francis. Do you really think you know exactly where he is going? Have you ever heard the saying about trying to second guess a Jesuit? You need to take it to heart.